Kraken, one of the world’s oldest Bitcoin exchange, has its headquarters located in San Francisco, U.S. It is the first cryptocurrency exchange to appear on the Bloomberg terminal. Even though Kraken exchange is not registered with any legislative board, still it is highly respected by regulated banks in the EU and the government of Japan. It accepts members from almost all the countries in the world. It offers extremely high security for its customer’s accounts so that it will be extremely difficult for hackers to steal the coins. This Kraken review will analyse several aspects to provide you with an all-rounded detailed overview of the exchange and its services. Although Cryptimi does its best to provide you accurate and relevant information which is updated on a regular basis, we strongly recommend for you to visit Kraken.com for any updates which might occur afterwards. Yes. When it comes to security, Kraken Exchange takes extensive measures to protect its customers’ funds. It offers multi-level protection for its customers’ accounts. Kraken offers 2FA (Two Factor Authentication) to protect its customers’ accounts from any unauthorised access. In case you lose access to your account, this exchange offers support to recover the account after verifying your identity. All the sensitive and personal information of its users is stored in an encrypted format. To further protect their data, users can make use of the GSL and Master Key features available on the exchange. Kraken is a digital asset trading platform which allows the users to buy, sell and margin trade cryptocurrencies. It is considered one of the world’s largest Bitcoin exchange due to its high liquidity and trading volume. It works on the maker/taker model and the fees vary based on the trading pair. Kraken Exchange doesn’t provide a personal wallet service for its users. It stores the coins of most of its customers on cold wallets until it is transferred to another wallet or exchange. Cold wallets are completely isolated from any online system to provide better protection for customers’ funds. To create a basic account on the Kraken Exchange, users don’t have to submit any documents and can start trading immediately after opening the account. It won’t take more than a couple of minutes to open your account on Kraken as it provides a simple and easy-to-use interface. If you forget your account’s password, Kraken helps you to recover it quite easily. It offers five different levels (also called Tiers) for your account. To move to the next Tier, users should provide additional documents for KYC verification purposes. Navigate to their site, enter your email address, username and password on the form titled ‘CREATE AN ACCOUNT’. Click the ‘SIGN UP’ button after agreeing to the terms. Next, click the activation link on your email to activate your account. Alternatively, you can enter the activation key manually on the provided box. Congratulations! You have now successfully created your account on the Kraken exchange. Navigate to their site and click the ‘LOG IN’ button located on the top right of the home page. Then, enter your email address, password and click the ‘LOG IN’ button. If the two-factor authentication is enabled, then you need to enter the authentication code every time you log in to your account. You need to provide additional documents only for Tier 3 and Tier 4 as the remaining tiers don’t require any kind of documentation. Kraken exchange verifies the customer’s accounts much faster when compared with other exchanges. Tier 1 and 2 accounts will be verified within an hour whereas the Tier 3 and 4 accounts may take 1-5 business days for verification. Kraken allows its users to buy the digital currency using fiat or cryptocurrencies. Currently, it accepts the following fiat currencies: EUR, USD and CAD. Apart from fiat, Kraken Exchange allows users to buy one digital currency using another, provided that the currency pair is supported. To know all the supported currency pairs on Kraken, check the ‘Supported Cryptocurrency’ section below. Before being able to buy any digital currency, you need to deposit funds to your Kraken account. Only those users who are holding Tier 2 or higher accounts, can deposit fiat currencies. All other users can deposit or withdraw in only digital currency. The trading fees vary based on the payment method and the digital currency which you would like to buy. 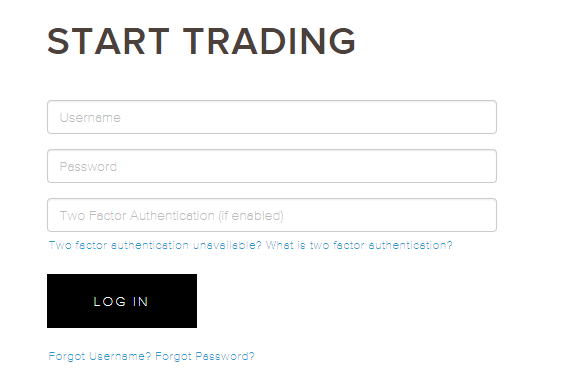 Click the ‘Trade’ tab and select the currency pair (Eg. 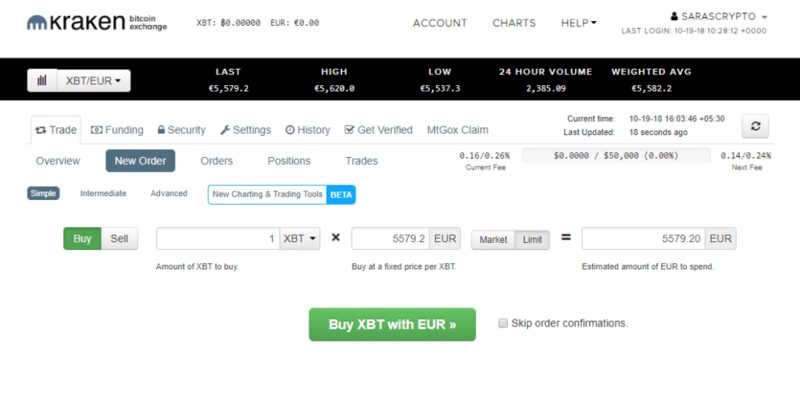 XBT/EUR) that you would like to buy from the drop-down menu located above the tab. Click ‘New order’ link from your account dashboard. It shows different ways to place an order like Simple, Intermediate and Advanced. In this example, let’s choose the Simple option as the intermediate/advanced options are intended for margin/leverage trading. Then, select the type of order: Market/Limit. If the option Market is selected, then the order will be processed immediately. In case of limit orders, the order will be processed only if the market price matches with the value set for the limit. Otherwise, you must wait till the price drops or cancel the order to create a new one. (In this example, we are using Market order). Enter the amount of XBT you would like to buy. (The estimated amount of EUR will be shown on the box labelled EUR). Next, click the button ‘Buy XBT with EUR’. You will see your order details on your screen with two buttons ‘Back’ and ‘Submit Order’. Click the ‘Submit Order’ button. Congratulations! You have placed your first order for Bitcoins. Once you receive the Bitcoins, you can transfer those to your personal wallet. Click the ‘Trade’ tab and select the currency pair ETH/XBT from the drop-down menu located above the tab. Follows Step 3 & 4 from the previous section. Enter the amount of ETH you would like to buy. (The estimated amount of XBT will be shown on the box labelled XBT). Next, click the button ‘Buy ETH with XBT’. You will see your order details on your screen with two buttons ‘Back’ and ‘Submit Order’. Your order will be added to the order book. Once you receive the Ethereum, you can transfer those to your personal wallet. For this example let’s consider buying Ethereum Classic with Ethereum. You can also buy Ethereum Classic with Bitcoin, but in that case you need to select the ETC/XBT pair. Click the ‘Trade’ tab and select the currency pair ETC/ETH from the drop-down menu located above the tab. Follows Step 3 from the previous section. Enter the amount of ETC you would like to buy. (The estimated amount of ETH will be shown on the box labelled ETH). Follow steps 5 and 6 from the previous section. Your order will be added to the order book. Once you receive the ETC coins, you can transfer those to your personal wallet. For this example, let’s consider buying Litecoin with Bitcoin. Click the ‘Trade’ tab and select the currency pair LTC/XBT from the drop-down menu located above the tab. Enter the amount of LTC you would like to buy. (The estimated amount of XBTwill be shown on the box labelled XBT). Next, click the button ‘Buy LTC with XBT’. Your order will be added to the order book. Once you receive the Litecoins, you can transfer those to your personal wallet. 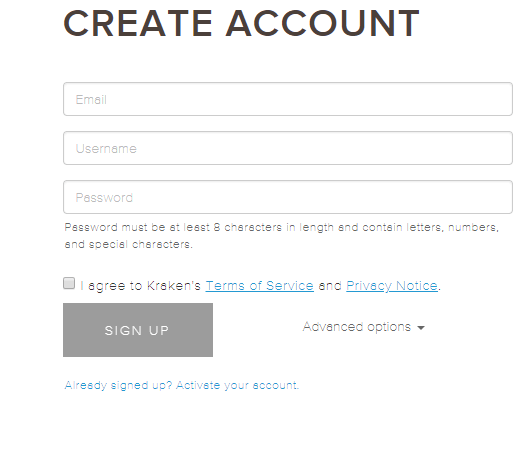 Login to your Kraken account and be sure you have a Tier 2 or higher account. If not, submit the required documentation. 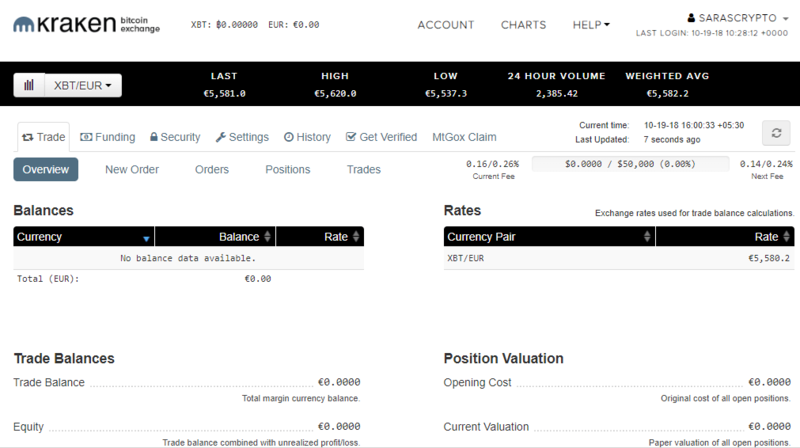 Click the ‘Trade’ tab and select the currency pair BCH/EUR from the drop-down menu located above the tab. Enter the amount of BCH you would like to buy. (The estimated amount of EUR will be shown on the box labelled EUR). Next, click the button ‘Buy BCH with EUR’. You will see your Order details on your screen with two buttons ‘Back’ and ‘Submit Order’. Follow the below steps to sell/cashout Bitcoin or other digital currencies on Kraken. Click the ‘Trade’ tab and select the desired currency pair (Eg. 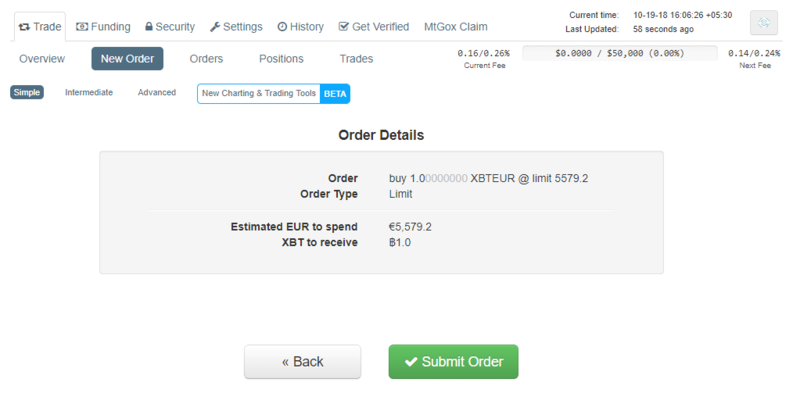 XBT/EUR) from the drop-down menu located above the tab. Next, click ‘New order’ link from your account dashboard. Select the option ‘Simple’ for the type of order. 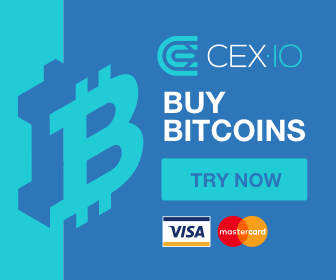 Then, click ‘Sell’ tab and enter the amount of XBT you would like to sell. The estimated amount of EUR that you will receive will be shown on the box labelled EUR. 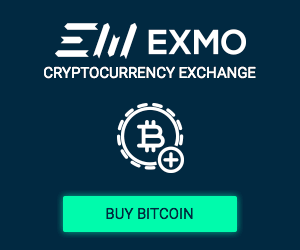 Next, click the button ‘Sell XBT with EUR’. You will see your Order details on your screen with two buttons ‘Back’ and ‘Submit Order’. Congratulations! You have successfully sold your Bitcoins on the Kraken exchange. Once you receive the funds, you can withdraw that to your bank account. Augur (REP), Bitcoin (XBT aka. BTC), Bitcoin Cash (BCH), Cardano (ADA), Dash (DASH), Dogecoin (XDG), EOS (EOS), Ethereum (ETH), Ethereum Classic (ETC), Gnosis (GNO), Iconomi (ICN), Litecoin (LTC), Melon (MLN), Monero (XMR), Quantum (QTUM), Ripple (XRP), Stellar/Lumens (XLM), Tether (USDT) and Zcash (ZEC). Except for a few countries, Kraken exchange accepts users from almost all over the world. If you don’t live in any of the countries listed in the ‘Excluded’ section below, then you can go ahead to create your account on Kraken exchange to start buying/selling/trading cryptocurrencies. Even though Kraken welcomes members from all over the world, it doesn’t accept users who are residing in the following country due to their local regulations. Every cryptocurrency exchange has its own fee structure and spending limit. Additionally, Kraken will charge Opening and Rollover, if you do margin trading. The deposit/withdrawal deducted by the Kraken exchange vary based on the payment method and the fiat currency. Except for a few digital assets, Kraken exchange does not charge any to deposit cryptocurrencies. Ether (ETH) and Ether Classic (ETC) – A Small fee to move ETH into the wallet. Withdrawal of digital assets is not free and the fee varies based on the cryptocurrency. 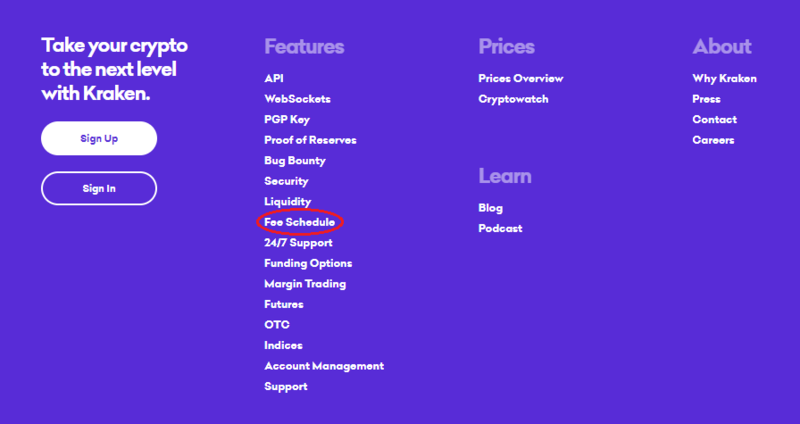 To know the fees of other cryptocurrencies, simply scroll down the main page, click on the ‘Support’ link, and look for the ‘Trading Fees’ section which can be found further below. Kraken exchange has set daily and monthly deposit/withdrawal limits for every fiat currency used on your account. To find out your daily/monthly limits, log in to your account and navigate to Funding-Withdraw/Deposit [Currency]. It will show the deposit/withdrawal limit for a day/month. The U.S. dollar limits start at $25,000 Daily and $50,000 Monthly. Additionally, the exchange has also set a margin borrow limit based on your verification tier. Kraken Exchange allows the customers to use any of the payment methods listed below based on their location. Kraken exchange aims to provide maximum protection to its customer’s accounts by enforcing several security factors like two-factor authentication, master key, global settings lock and strong passwords. 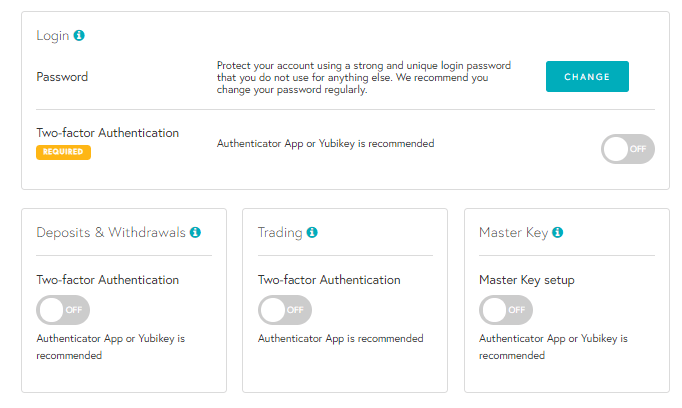 2FA can be configured using Authenticator app, Yubikey or a static password. Master Key is a security feature that can be used to recover your account if you lose your login credentials. Global Settings Lock (GSL) will safeguard the settings on your account. Kraken recommends that GSL is turned on when storing cryptocurrency for an extended period of time. In doing so, you set a lock, which must be unlocked to perform any changes such as changing your personal Bitcoin wallet address. This lock can only be opened after a pre-set day limit. So, if someone had to hack a customer’s account, they wouldn’t be able to immediately steal their coins, because they would have to wait the 6 days to pass, by which time the customer would be able to contact the Kraken customer support to recover your account. In addition to the GSL, Kraken recommends its users to create a strong password made up of characters which are difficult for potential hackers to crack. In case you experience any issues with your account, you can contact the Kraken Support by creating tickets or via their live chat feature. In general, one would have to wait 1 day to a week to get a response. However, when they get back, they are very helpful. To contact Kraken via a ticket, simply scroll down to the bottom of the site’s front page, click on ‘Support’ and select your issue from the drop-down menu. Then, fill in all the required information and click the ‘Submit’ button to submit your query. Kraken exchange doesn’t provide support via phone or email. This feature is not available yet. (In the past, there was an iOS app for the exchange. But Kraken has withdrawn the support). Recently, Kraken exchange has added the new coin Tezos (XTZ) for its customers. Kraken is developing new trading tools for its users and the beta version is already live on their website. You can also visit their official blog to read the latest stories. Kraken Exchange is not only a good option for the novice traders but also for the serious traders as it allows its users to trade more than 50+ currency pairs on its exchange. Kraken Exchange provides much better security using its advanced security features when compared with other cryptocurrency exchanges. The only thing missing on Kraken is Mobile app.